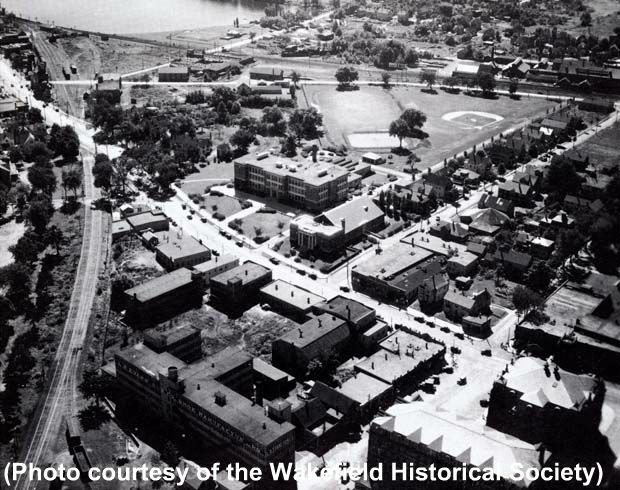 "The Atwell High School, built in the early 1920's, was the site of the former Cyrus Wakefield estate. At the rear of the school was a tennis court, football field and baseball diamond. The Wakefield Theatre was opened in 1916 in the Appleton Building by Charles W. Hodgdon, owner of the Premier Theatre (later the Princess Theatre) on Mechanic (Princess) Street. The theatre closed in 1972. L.B. Evans' Son Co. Shoe Manufacturer building was built in 1893 with additions in 1903, 1911 and 1920. The building and the company were sold in 1979. The Elizabeth E. Boit Home for Women was established in 1894 and is located at 5 Bennett Street (far left, near the center of the photo.) Additional information about the Boit Home is provided elsewhere. The Henry F. Miller Piano Company moved to Wakefield in 1884 to a six-story building behind the former Town Hall at the corner of Water and Smith Streets. The company manufactured pianos at the site until 1929 and relocated back to Boston in 1932. Wakefield Town Hall was built during the late 1860's after Cyrus Wakefield presented the town with a donation of $30,000 and a building lot in 1867 for the purpose of erecting a soldiers memorial hall. The town hall was dedicated on February 22, 1871. The building was destroyed by fire and was subsequently razed in 1958." -- Text from calendar by Jayne M. D'Onofrio. “South Main Street, circa 1930,” NOBLE Digital Heritage, accessed April 20, 2019, https://digitalheritage.noblenet.org/noble/items/show/7074.